Based on our site’s analytics, most of our readers are female. So why write a post about men’s health? Well, we all have men in our lives who we love dearly. Whether it’s our dads, our brothers, our husbands, our sons, or our good friends, for one reason or another these men don’t tend to put their health as their number one priority. Most women I know are pretty good about going regularly to the dentist, getting their mammograms, their well woman exams, and so on. But for men, it’s just not at the top of their list. Yes, it’s depressing when you think about it, but while I’ve got you thinking about it, here are ways to prevent these from happening. And because I’m just so darn awesome, I’ve provided you with a handy graphic that you can print out on your computer and post up on the refrigerator to remind your man AND to remind YOU to remind your man to keep up on his health. Yeah, I know, it can be a buzzkill at times, but it’s either be the party-pooper or see your man suffer in his golden years. Men are more likely than women to carry fat around their abdomens. Belly fat is more dangerous than fat in the hips and thighs because it settles around your organs. This can cause heart disease, diabetes and stroke. Men with a waist measurement of 40 inches or higher have an increased risk for these issues. To measure your waist, relax and wrap a tape measure around your belly just above your hipbones. Testicular cancer is most common in men between the ages of 18 and 35. Checking your testicles on a monthly basis is important for men of all ages. Gently roll the skin of your scrotum around your testicles with your thumb and fingertips. Your epididymis is the cord closer to your body that transports sperm. But, if you notice any other bumps, lumps or areas of tenderness, report it to your doctor. If you smoke or use other tobacco products, ask your doctor to help you quit. And while you’re at it, avoid exposure to secondhand smoke as much as possible. For help with quitting go to SmokeFree.gov. To talk to someone about quitting, call the National Quitline at 1-800-QUITNOW (784-8669). Eat a lot of vegetables, fruits, whole grains, high-fiber foods and lean sources of protein, like fish. Eat less foods that are high in saturated fat, sodium, and sugar. Follow your doctor’s treatment recommendations for high cholesterol and high blood pressure. Choose sports or other activities you like to do. Physical activity on its own may lower the risk of certain types of cancer. Being overweight can increase your risk of heart disease and various types of cancer. Balance the calories you take in from food and drink with the calories you burn off. Track your BMI (Body Mass Index). A BMI over 30 is considered obese. Work with your doctor on getting help to lose weight. Obesity can lead to diabetes and cardiovascular disease. Excess alcohol can raise blood pressure and increase your risk of various types of cancer, including colon, lung, kidney and liver cancer. Feeling constantly on edge can cause your healthy lifestyle habits to take a back seat. Also, learn how to deal with stress in healthy ways, such as physical exercise. 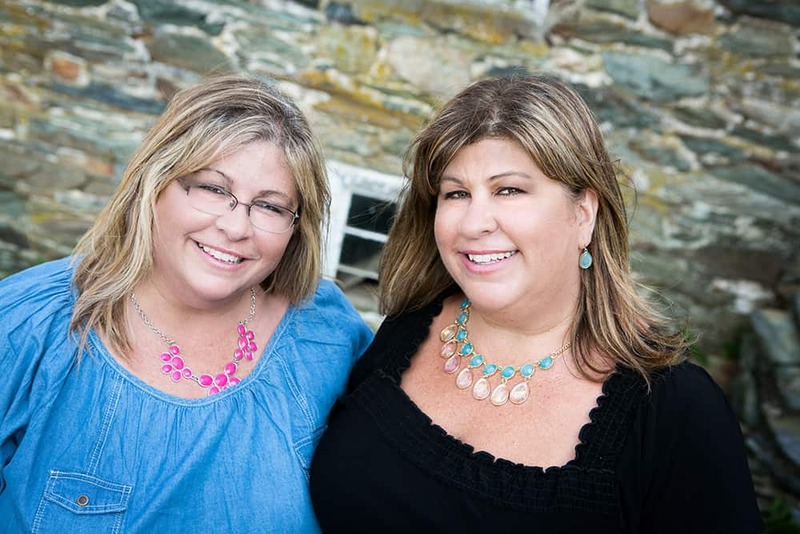 We all know that too much sun exposure can lead to skin cancer and premature aging. Apply sunscreen and cover up whenever you’re outdoors. Minimize exposure to chemicals and outdoor air pollution. Get an annual flu vaccination. If recommended by your doctor, get a pneumonia vaccination as well. If 45 or older, ask your doctor if you should take aspirin to prevent heart disease. Car crashes are a leading cause of fatal accidents among men. Use common sense when driving: wear your seat belt, drive the speed limit, don’t drive after drinking alcohol or after using any mind altering substances, and don’t drive while sleepy. 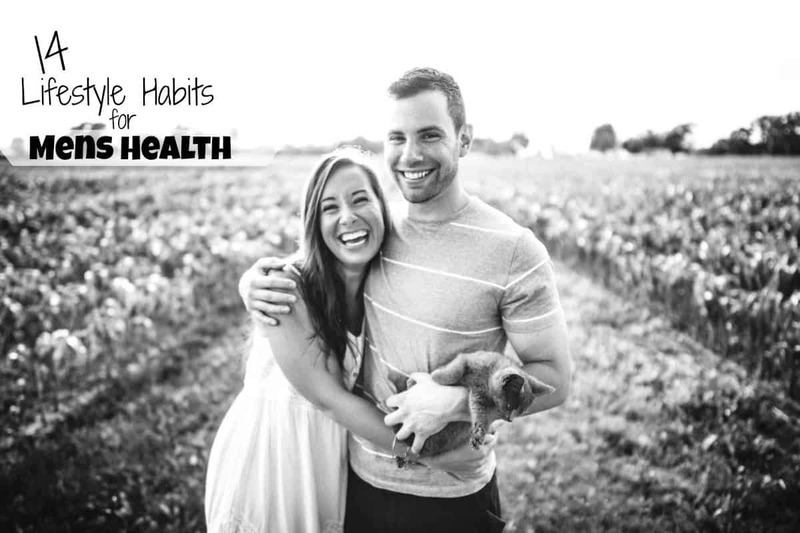 Yes, this is quite a list of habits to keep up with, but doing these things in order to prevent irreversible damage is key to a long, healthy, happy life. 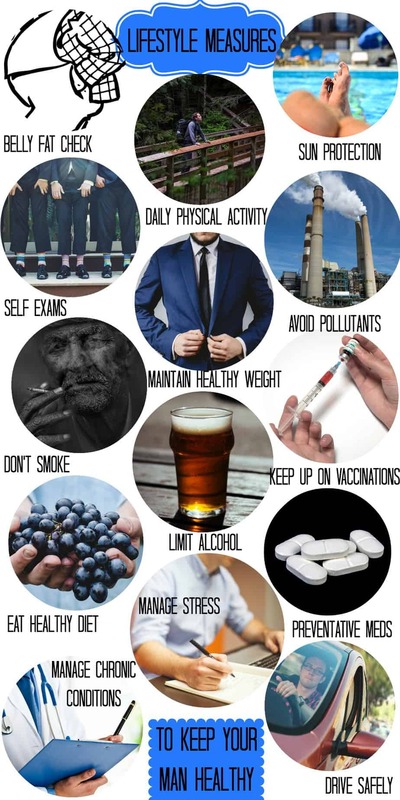 What other lifestyle habits for men’s health should be included on this list? Great advice, now if the men we know would take this advice, at least some of it…..!!! I don’t remember if you mentioned having a PSA test?? Thank you Cheryl! Yes, prostate screening is mentioned under ‘Manage Chronic Conditions’, but I’m glad you mentioned it. Prostate screenings are so important!